With the flexibility of choosing the appropriate powder, you can easily switch from supra- to subgingival by simply turning the selection ring between prophy and perio. Always best access - 90° and 120° angled spray nozzles for supra- and subgingival use in periodontal pockets up to 5 mm depth.The Perio nozzle equipped with the disposable sterile Subgingival Perio Tip provides optimal access in pockets deeper than 5 mm.The optional nozzles are also available in two lengths, for greater efficiency and flexibility. 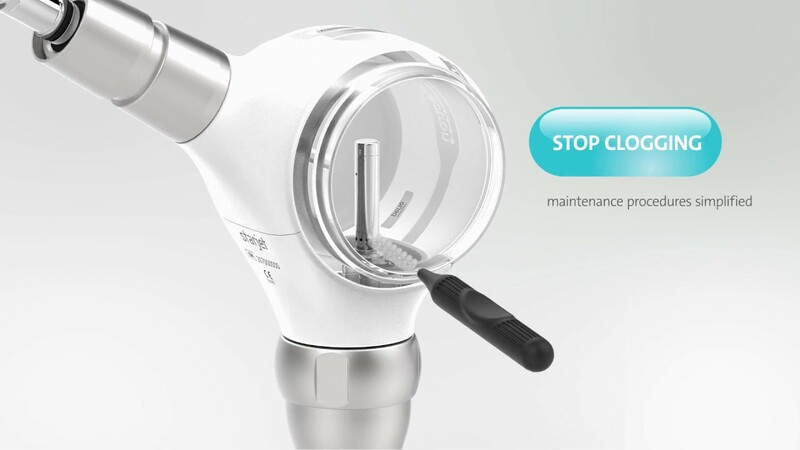 Just one click connects the nozzles safely to the air polishing handpiece,thanks to a dedicated security connection system. Refills are clean and simple due to the lateral opening of the powder chamber. No balancing act or messy spills. For the best powder level visibility. Flexible and soft - the subgingival, disposable Perio Tip will come sterile and attaches easily to the perio nozzle by hand. Glycine powders have much smaller particles (D50 < 25 μm) than sodium carbonate powders and are water soluble. They have a sweet taste. Allows safe and efficacious removal of subgingival biofilms in patients receiving periodontal maintenance care. The removal of intra-oral biofilm in patients with orthodontic appliances and the prevention or treatment of peri-implant infections can be added to the extensive list of air-polishing applications with easyjet perio and mectron glycine powder. The use of a glycine powder leads to a reduction in pocket depth comparable with conventional scaling and root planing*. The benefit is easier handling, faster treatment and better patient acceptance. Patients report less pain and a more pleasant taste with glycine powders.